The schools are back and, as so often is the case, we’re now being treated to a glorious Indian summer. Although having said that here in Suffolk we’ve had a great summer – almost too hot at times for the true Brit!!! To us, one of the pleasures of autumn is going foraging for all the edible goodies that can be found in the hedgerows at this time of year. Not only are they organic, but come with zero food miles and exercise built in. The one that marks the start of the autumn foraging season – as well as being a favourite of so many people – are Blackberries. And who doesn’t love a blackberry and apple crumble or perhaps pie; not forgetting the ever popular favourite blackberry and apple jam? Often referred to as brambles – and as soon as you start picking them, you’ll quickly discover why – blackberries are one of our truly native crops; although their cultivated cousins are now grown worldwide. Preferring good drainage they happily grow on a wide variety of soils, although they seem to do best in places where nothing else wants to grow. Disused railways and old paths are usually guaranteed to have them, often growing in wild abandon. Technically each blackberry isn’t a single fruit, but a collection of tiny fruits arranged in a bunch, rather like a bunch of grapes. With each one containing a tiny seed, it’s easy to see why seeds so easily get stuck in your teeth! Nutritionally blackberries are high in Vitamins; not only Vitamin C but A, E, K and B as well. And don’t forget that they contain a range of other antioxidants as well and not only Vitamin C. Blackberries also contain a range of minerals including copper, manganese, magnesium and potassium. Blackberries are a good source of fibre, soluble and insoluble, as well as being low in calories at around 43 calories per 100 grams. The real joy of blackberries is their versatility. While we’re already mentioned some of their best known cooked uses, they are great raw in fruit salads and smoothies. And, as they freeze well, they can be thawed to use in smoothies all through the winter. If we’ve encouraged you to go blackberrying this year, please don’t waste any time and get picking now. At their best during September and early October, blackberries quickly lose their flavour and texture as the weather becomes damper and the nights cooler. Or, as the old proverb says, “On Michaelmas Day, the devil puts his foot on the blackberries.” Legend has it that on Michaelmas Day, October 10th, Lucifer was banished from heaven. Falling to earth he landed on a blackberry bush and scorched it with his fiery breath, making the fruits unfit for human consumption. You have been warned! 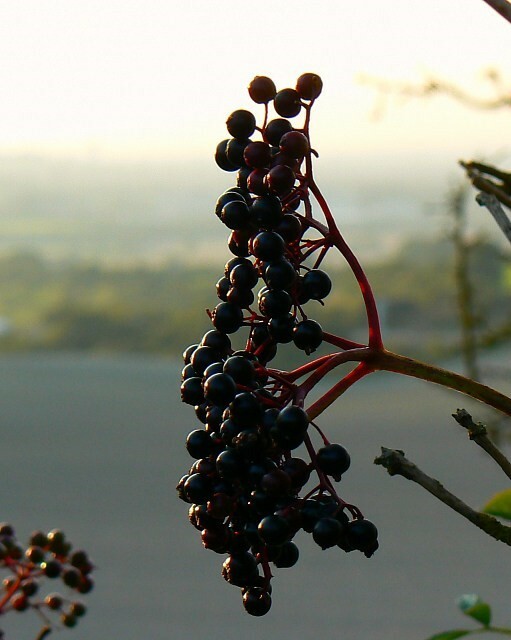 While we’re talking about the joys of foraging, let’s not forget another autumn berry, the Elderberry. And this year is going to be a bumper year from what we’ve already seen on our first forays! Unlike blackberries, elderberries are better known for their healing / medicinal properties than their culinary ones. This is probably due to their tartness and stronger flavour, which is less palatable and harder to disguise. Again they seem to prefer well drained soils and are often found growing quite happily alongside blackberries. With the bunches being much easier to pick, the real challenge is getting the berries off the stems. This can be done quite easily using a fork – although be warned, the berries can end up going in all direction during this process (!). Nutritionally, elderberries have high levels of Vitamin C and other antioxidants. They also contain Vitamin C, B6 and Iron, along with both types of fibre. Like blackberries, elderberries are low in calories at around 73 per 100 grams. Elderberries have traditionally been used medicinally for a wide range of problems such as congestion, arthritis, upset stomachs, flatulence and detoxification. Modern research has confirmed these traditional uses with their anti inflammatory, anti viral and antiseptic properties being particularly highlighted. Many off the shelf products contain elderberries, with Sambucol – used to shorten the duration of colds and flu – probably being the best known one. We must quickly mention a lovely story we’ve come across about an American sailor who found that cheap port wine, coloured with elderberries, relieved his arthritis! So how can you use elderberries at home? 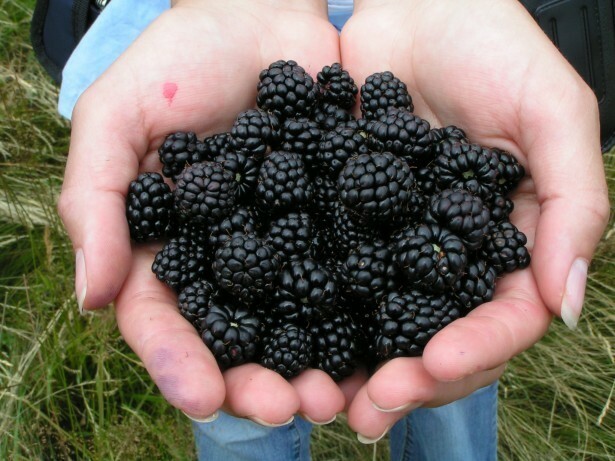 Like blackberries, they can be used in pies and crumbles with apple and other berries or as a savoury relish with meat. And, for the more adventurous, there’s always elderberry wine. We use them to make a syrup – similar to Sambucol – which keeps well in the fridge and can be used when family or friends succumb to colds, flu or other winter nasties. One quick word of warning though. Elderberries should NEVER be eaten raw as they contain a cyanide like chemical. Cooking breaks this down, allowing elderberries to be safely consumed. And if you ever forget this, they’ll remind you of this by being quite unpalatable when raw! We’ll be back later in the month with more foraging ideas for you, featuring two other hedgerow fruits that aren’t ready until later in the season. So why not go for a walk and a forage this weekend? It’s great fun and incredibly satisfying.